New Shepard’s Ninth Mission Tests High-Altitude Escape Ability - VPT, Inc.
July 19, 2018 — Blue Origin performed a critical test on its New Shepard rocket this week – a high-altitude escape motor test to assess its performance in an emergency situation. From its west Texas launch facility, Blue Origin launched its reusable rocket, but instead of a typical launch where the crew capsule and rocket separate at the edge of space, this time they ignited the escape motor on the capsule. While a previous test of the motor was conducted in 2016, this time around Blue Origin ignited the capsule at a higher altitude, successfully testing its emergency abort capabilities. The escape motor was ignited after the crew capsule separated from the rocket, driving it to a record height of approximately 74 miles above Earth. The test caused the capsule to withstand up to 10 Gs, which is within the range of what a human can tolerate. 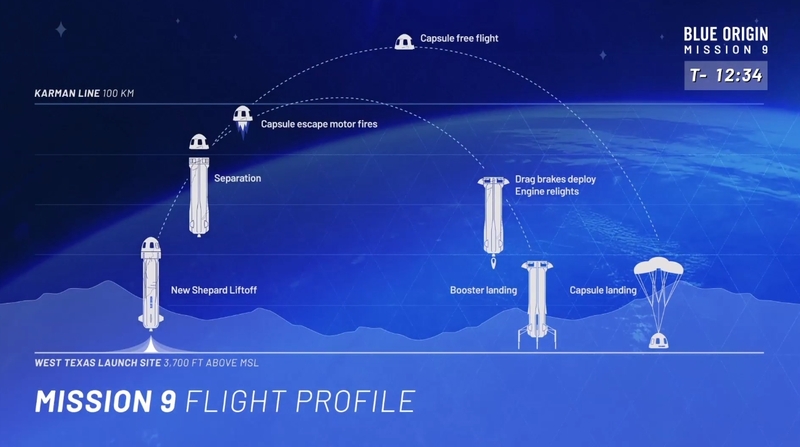 The success of the launch, landing, and emergency abort test raises hopes of future tests with a human crew, possibly as early as the end of 2018. While this flight was unmanned, it did include test dummy “Mannequin Skywalker” as well as seven commercial payloads. Among them are an electromagnetic field experiment from Johns Hopkins University APL, a suborbital flight experiment from NASA to record vehicle conditions such as cabin pressure and temperature, as well as a suite of payloads from Blue Origin employees that is part of its “Fly My Stuff” program. With VPT parts on board, we’re proud to congratulate Blue Origin on another successful and unprecedented test mission. To see the launch in its entirety, the video of the webcast can be found here.